The Moonstone, my latest Classic Club Spin, is billed as the first proper detective novel and I can see why. A country house, a distraught heiress who is hiding something (but what? ), a butler, a detective who can learn a lot by a smudged bit of paint, handsome gentlemen with non to clear motives, and a missing diamond. Add in plenty of red herrings and accusations and you have a great “whodunit”. 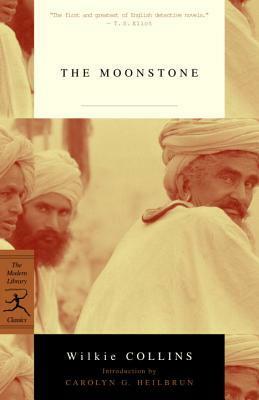 The story of the missing diamond (known as the Moonstone and obtained by the distraught heiress’ uncle under questionable circumstances whilst fighting in India) is told in turn by each of the primary characters. Each tells only of their direct knowledge of events, meaning you are always filling in the gaps as the story progresses and wanting to know what happens next (I was pretty much wrong the whole way through!). Wilkie does a good job of distinguishing the voices of each person, although the attitudes are a bit dated in a few parts made me cringe as a result. He also uses them to add a bit of social commentary here and there – especially through the Betteredge the Butler – which I liked given my love of politics and there is also the odd bit of humour, making me smile if not laugh out loud. The main person you want to hear from, of course, is the Heiress, Rachel. She seems to be the only one who knows what has happened to the Moonstone and keeps everyone guessing, running off at one point to avoid being interviewed by the police. By the time I got to her version of events I was holding my breath a little. In fact, I did that on and off all the way through. By the end of each person’s story, I really, really, wanted to know more and found the book harder and harder to put down as the story went on. When I’d added this book to my Classic Club list, I wasn’t sure what to expect but I had a good response to my post, telling me it was a good book and so I hoped I would enjoy it. I really did. I haven’t read any other Wilkie Collins but I will now. Possibly my best classic club pick yet! Me too! I had high hopes and was worried I would be disappointed. I love hearing of another Wilkie convert. You should definitely try The Woman in White next – more of a psychological thriller. I have downloaded The Woman in White and will definitely be reading it. Probably in the not too distant future!.